We went, we saw ….. we didn’t quite conquer (apart from some nerves perhaps) but we put on a good show, playing competitively, with good humour and sportsmanship. We didn’t win any of the three pool matches, though managed 12 wins out of the 33 games, scoring 29 match points out of a possible 93, against some very strong teams of experienced players – including a good number of top English International and Regional players. A good experience overall which gives us some clear, positive targets for future development. Credit and thanks also to other squad members who played in previous qualifying rounds and aided us into the semi-finals. 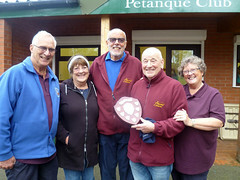 We played today against Great Yarmouth Petanque club in the Semi final of the Eurocup plate competition. I am pleased to tell you we won , so will be competing in the final , date and venue to be confirmed. Our team was, Jenny Robb, Lynn Snowden, June Ricketts, Mick Bachner, John Collins, Paul Bult, Mike Ricketts. Well done to both NCPC and Arena PC on your achievements. 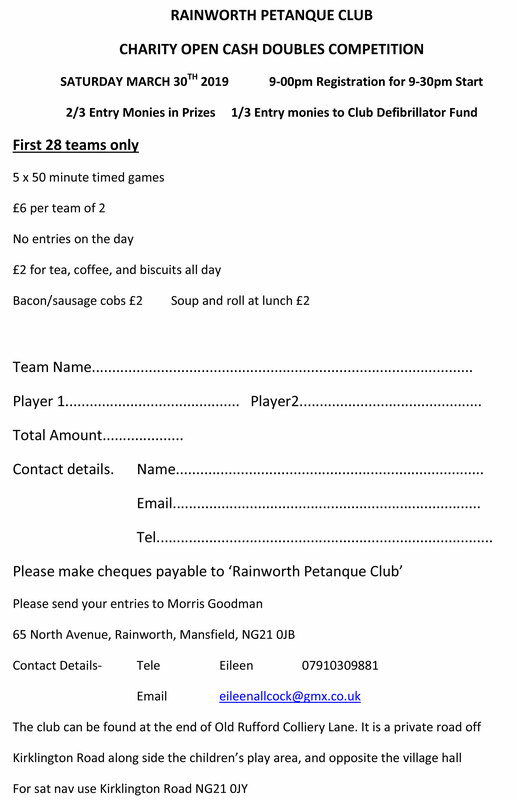 Rainworth PC are holding an open doubles competition on Saturday 30th March. Please see the details below for entry. Entry is now open for this year’s Sherwood Shield club competition. Please follow the link below to see the criteria for entering this year’s competition and to complete the entry form. Please give your support to Lincoln Branley PC’s ‘Cash Prize Doubles’ on Sunday 21st April. Please give your support to Chesterfield PC’s ‘Cash Doubles Speed Mêlée’ on Saturday 6th April. 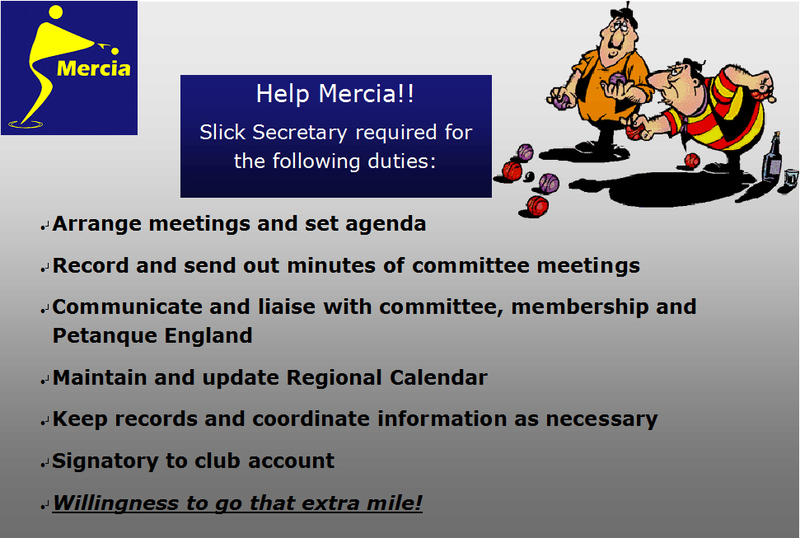 Mercia are looking for a Regional Secretary. If you are a licenced Petanque England Mercia member, you are eligible to apply for this position. Please contact John Proctor at the following email address for more information. 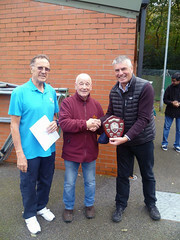 Thanks to John Proctor for all his hard work as Mercia Winter League organiser for all 3 rounds. Thanks also to all the hosting clubs and their helpers. 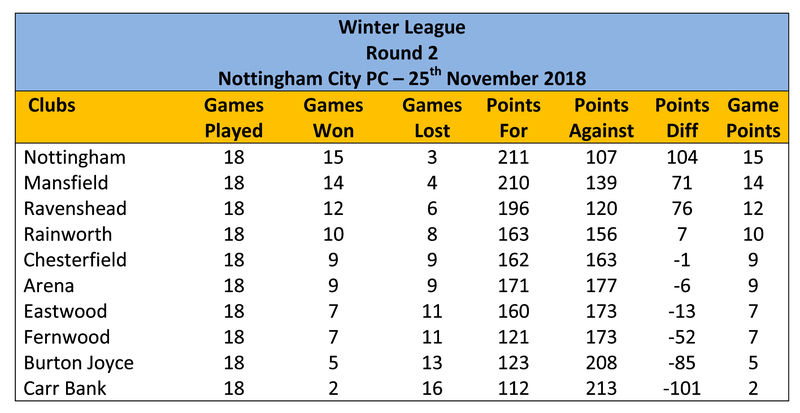 Well done to all the competing clubs and congratulations to Nottingham City PC on retaining the winter league trophy. We are now taking team entries for the 2019 Mercia weeknight triples league. Please follow the link below to submit an entry for your team. 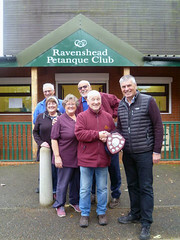 The ten clubs participating in this year’s winter league gave us another great day’s Petanque at Nottingham City PC, our thanks goes to all those who played today. Our thanks to NCPC for hosting the 2nd round today and to all the volunteers who prepared the venue for the day’s play and to those who helped with refreshments. Our thanks also to John Proctor who was Mercia’s competition organiser for this round. The Mercia Winter League got under way today on a bright, but cool day at Titchfield Park, Mansfield. A record ten clubs are competing for the winter league title this year, with a good number of the clubs bringing a mix of both established players and newer members who were playing in the Mercia Winter League for the first time. It was great to see so many new faces and we hope they all enjoyed the day. 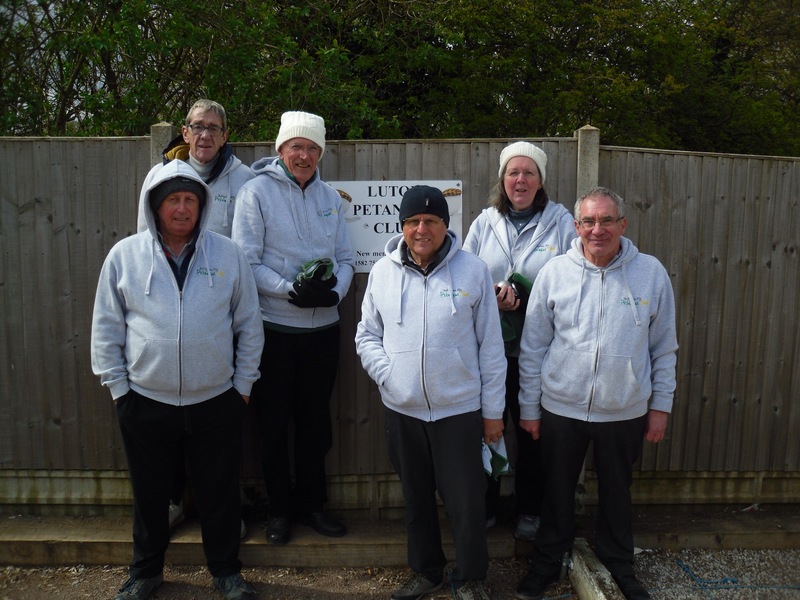 Our thanks goes to Mansfield PC for hosting this 1st round of the winter league and to all the volunteers who prepared the pistes for the day’s play and kept the refreshments flowing. Our thanks also to John Proctor who was competition organiser for this event.